Features including free Wi-Fi an indoor pool and a game room can be found at the non-smoking AmericInn Lodge & Suites Green Bay East. The two-story AmericInn of Green Bay East features 67 rooms with free Wi-Fi flat-panel TVs premium bedding microwaves mini-fridges and coffeemakers. 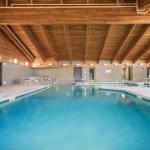 Refuel each morning over free breakfast before making a splash in the heated indoor pool and hot tub. Business and fitness facilities are also provided and there's a game room for when it's time to relax. The front desk is open 24 hours a day. Pets are permitted for an additional fee and you can park for free. Off I-43 the AmericInn lies five miles southeast of central Green Bay and one mile from Willow Creek Park. Drive less than 10 minutes north to reach the waterfront Bay Beach Amusement Park. Guests can also watch a Packers game at Lambeau Field 10 miles away or drive about 10 minutes to hit tee time at Ledgeview Golf Course. The hotel is 11 miles from Austin Straubel International Airport.